Tis the season for holiday parties. And with them, the nagging question, “What should I wear?” The NYTimes Style section recently tackled the issue with some advice about “festive attire” for men. We decided to chime in with some handsome suggestions. Love Triangle is a ” a silk cotton “tie shirt” inspired by neck tie weaving. With a soft, luxurious hand, this colorful shirt is a Holiday must-have. Mostly silk with a bit of cotton, “Sideline Solid” has a subtle textural pattern, and just the right amount of sheen. Perfect for the holidays or any special occasion. Stand out from the crowd in “Pipeline,” a silk-cotton jacquard. This classic pattern will always be in style. Lastly, an eye-catching suggestion from our (JB) i.d. collection. 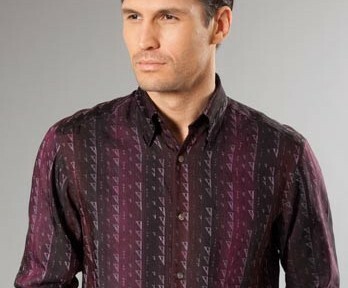 “Pizzazz” is a fun interpretation of a tuxedo shirt. I love the way the strips of printed fabric add contrast and texture to the white shirt. I think you’ll love this one! This entry was posted in Fashion/Style and tagged festive attire, holiday, menswear on December 12, 2012 by LOri39.